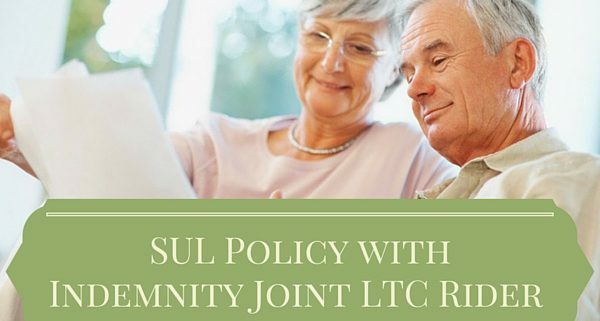 A popular new product that has aroused the interest of many estate planners is a Guaranteed No-Lapse Survivorship Universal Life (SUL) Policy with an indemnity joint long term care (LTC) rider. This type of policy would typically be owned by an irrevocable life insurance trust (ILIT) to provide an income and estate tax-free death benefit at the second death. 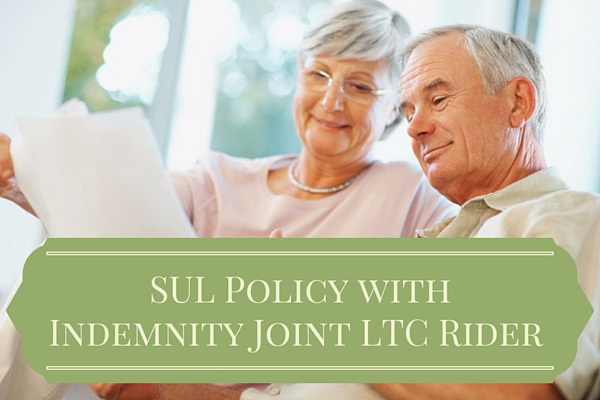 The indemnity joint LTC rider would be available to provide potential LTC benefit payments to the ILIT to offset lifetime extended care medical costs of a married couple. The “indemnity” type of rider is crucial for the ultimate life insurance death benefits to be estate tax-free. Why? Because any rider benefits will be paid only to the ILIT as the policy owner, and NOT used to pay extended care costs directly to the extended care provider. The payment of LTC benefits are paid only to the ILIT and are NOT required to pay for any specific extended care expenses incurred, this indemnity LTC rider would not create an “incident of ownership” in the UL policy. Any “incidents of ownership” in a life insurance policy would cause the life insurance death proceeds to be included in the gross estate for estate tax purposes. This indemnity LTC rider is contrasted with so-called “reimbursement” LTC riders. Reimbursement riders pay extended care benefit payments directly to the provider on behalf of the insured. Most commentators have taken the position that this “reimbursement” type of LTC rider on a life insurance policy owned by an ILIT would be considered an “incident of ownership” that would cause the life insurance death proceeds to be included in the gross estate. Your clients who are successful business owners, professionals, and wealthy individuals who may have gross estates large enough to be exposed to federal estate taxes, state death taxes, and “income in respect of decedent” (IRD) income taxes on their QRP/IRA assets. •An income and estate tax-free death benefit to offset estate and income taxes due at the survivor’s death in a financially efficient manner. Option 1: Carrier makes income tax-free LTC claim payments to the ILIT. ILIT “keeps cash” in the ILIT to be invested in a side fund. •ILIT keeps LTC claim payments in the trust and invests in stock, bonds, mutual funds, annuities, etc. •The married couple pays any LTC care costs out of pocket from other personal assets. These payments for LTC medical services will reduce the gross estate for estate tax purposes by the amount of these out of pocket payments. •At death of the survivor, the net life insurance proceeds paid to the ILIT from the base SUL policy are income and estate tax-free. Option 2: Carrier makes income tax-free LTC claim payments to the ILIT. ILIT “loans cash” to insured estate owner. •ILIT makes a loan to the married couple. Interest only note payable at current AFR rate is executed between the irrevocable trust and the married couple. •The married couple uses the cash received from the loan to pay extended care LTC expenses. •The married couple makes annual interest payments on the note to the ILIT from other personal resources. •At death, the estate of either spouse pays off the loan principal on the note to the ILIT from other estate assets and takes an estate tax deduction for debts paid from the estate on Line 2 of the Form 706 U.S. Estate Tax return (IRC Section 2053(a)). Option 3: Carrier makes income tax-free LTC claim payments to the ILIT. ILIT “distributes cash” to ILIT beneficiary (adult child). •The adult child voluntarily (under no obligation) makes an unlimited gift tax exclusion gift of this cash on behalf of either parent to pay the LTC medical expenses of either parent under IRC Section 2503(e). •At death of the survivor, the net life insurance proceeds paid to the ILIT from the SUL base policy are income and estate tax-free. The type of joint indemnity LTC rider we are talking about may either be a “qualified” LTC rider under IRC Sec 7702B … or an accelerated death benefit rider for “chronic illness” under IRC Section 101(g). Both types of indemnity riders pay income tax-free benefit claim payments to the ILIT as the policy owner when triggered. Any tax-free benefits paid under both types of riders will reduce the life insurance death benefit paid to the ILIT dollar for dollar. Contact your BSMG Advisor for a discussion on how to structure a no-lapse SUL policy with an “indemnity” joint LTC rider owned by an ILIT. This protection plan can offset any second death estate costs AND offset lifetime LTC costs for either spouse with income tax-free benefits.